Inside: Get online professional development and child care training courses without leaving your home or classroom! 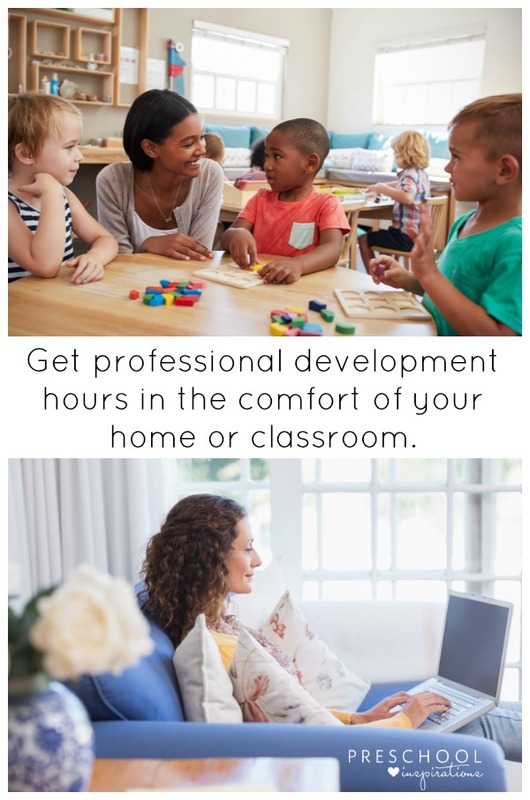 I’m partnering with ChildCare Education Institute to share about one of the most convenient and easy ways to get CEUs and professional development hours. Make sure to see their exclusive offer below for being a Preschool Inspirations reader. Do you see that last one? The one right at the bottom. See, as teachers and child care providers, we focus our time and attention on everyone else. And before we know it, we are scrambling to get our own things in. So for years, getting my training hours finished up has been last on my list. And it got stressful as that deadline inched closer. I am so busy filling up my calendar with the other things I need to do for my students and families (as well as my own family). So each year I have to squeeze things around to fit in time for my own training hours. Let’s be honest. When it comes to spending a weekend with my family or working on the weekends, I’d rather be planning a trip to the beach or going out to coffee with a good friend. This was my life for years — until I found a better way! I have been saving so much time by finding online training courses for preschool teachers. Instead of blocking out big chunks of time for professional development hours, now I get them done when I have 15 minutes here or 30 minutes there. As the internet is expanding, so are training courses for teachers and childcare training. All through the world of online professional development. No longer do we have to go through the hassle of finding a training in our area, traveling to it, buying meals and missing out on other events because we have no control over the timing of a training. I have been getting training hours and professional development hours the easy way – at home, with a cup of coffee or tea nearby, lounging on the couch with my laptop. Sometimes I start one in the middle of the day and finish it in the evening once everyone else has gone to bed. Other times I do the entire training in one sitting when things settle down a bit. The most recent training I did through ChildCare Educational Institute (CCEI) made it so easy to take a training course. If you don’t have a whole hour to finish your training at once, all you have to do is login when you are ready to finish. It will be there waiting for you – no matter what time of day. I know that I can find four 15 minute pockets of time a lot easier than an entire hour. Plus, when I start it because I know I have those 15 minutes, I find that I am finishing them a lot quicker too because I’m more motivated to get them finished. But not all online teacher training courses are created the same. Definitely do your homework. Will my hours be accepted? This here is a big one. It’s important to make sure that your training hours actually count. Every location is different, and in the U.S., each state sets their own laws and regulations for this. ChildCare Education Institute provides online professional development courses that meet state training requirements. Is this a high-quality training program? I have signed up for online courses before and was left disappointed in the quality. It felt like a waste of time and money. Make sure to find one that has been recommended to you by someone who has already gone through one or has really good reviews. I recommend starting with ChildCare Education Institute. If they met my picky standards (high-quality, developed by professionals and experts, technically easy to navigate, written in a way that is easy to read, and more), then I know that their courses will be a great fit for you too. After I went through a course by CCEI, I was thrilled to have a program that I could highly recommend to friends, colleagues, and readers. I knew it would be beneficial and convenient for anyone who decided to try it out. Not only was it successful for me, but 99.9% of people who have taken it also say they would recommend it. Is the online professional development relevant? There are two types of trainings that stick out to me: trainings that I loved and learned a lot from and courses that were full of information that I had already heard before. Since our time is valuable, I try not to waste my time on trainings that leave me bored and have me thinking about what areas of my house need to be cleaned. Even if you need your CDA accreditation or renewal, you can do it all online through CCEI. Whether you are a teacher, childcare worker, family child care provider, director, or even work in Head Start, there is specialized training for all these areas. I love how they think of everyone! I decided to take the course called Launching Learning Centers in Your Classroom. Not only was it informational and easy to navigate, but I found the time going quickly because it was something I was really interested in. Are you interested in taking a peek? Here’s one of the course authors from ChildCare Education Institute, Rae Pica, talking about the importance of movement, learning, and the whole child. If you’re interested in trying out an online child care training course or online ECE course, you can even try out a trial course for free to see what you think. Plus, for all of the readers at Preschool Inspirations, you can get a year of courses for 50% off of their Individual Annual Subscription with the code INSP50OFF. That’s $49 for a year of unlimited courses! Whether you need childcare classes, early childhood training, early childhood professional development, Head Start courses, or more, CCEI has lots of choices and options. This way, you can choose the online professional development training that works best for you. Check CCEI out today by visiting www.cceionline.com or enrolling now. Can you give me an idea how much the courses cost on the CCEI SITE? I saw where a trial is free but after the free opportunity, what kind of cost am I looking at. Definitely checking with my school system to see if they approve this. Thank you! Great question! They have a few options. To get 1-10 hours, the rate is $15 per hour. My favorite option is an annual subscription for $99 with unlimited access. Here is the link that explains that more and can give you some extra details about each state. Let me know if I can answer any other questions for you :).